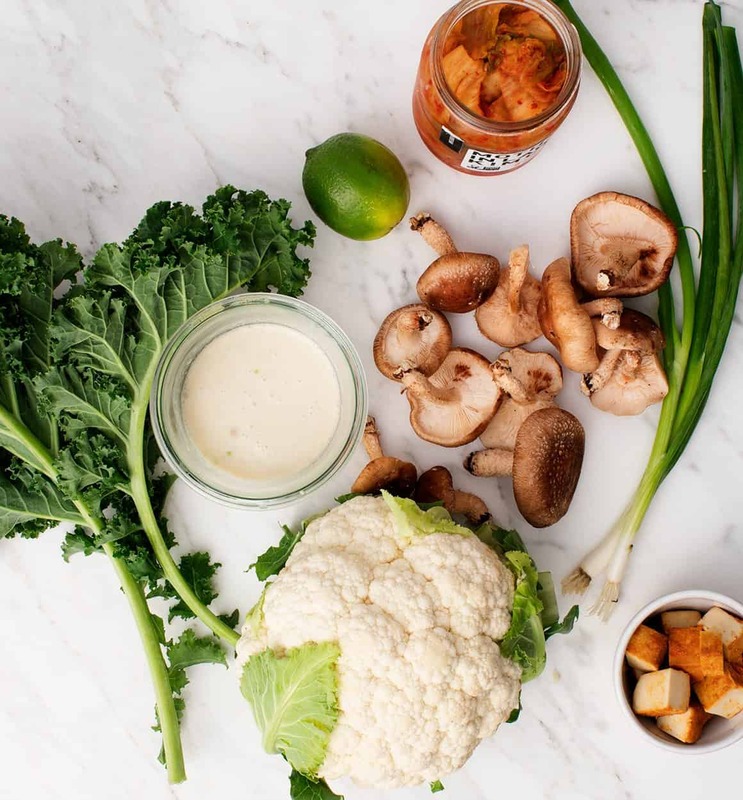 Bowls of cauliflower rice topped with tofu, veggies, kimchi, and creamy coconut sauce make a fun, healthy weeknight dinner. Vegan & gluten free. You probably already know about my love for cauliflower rice by now, but something I’ve never posted about are kimchi bowls… or kimchi anything for that matter because for awhile I thought it was an ingredient that would be difficult to find. But I see it everywhere now, so here we go, let’s bowl! 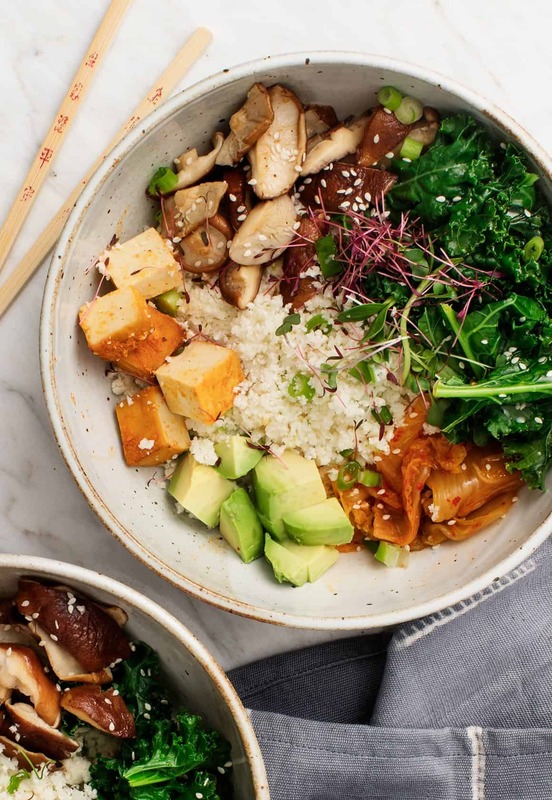 Whenever I need a reset or just a well-rounded meal, I love bowls that are balanced with greens, veggies, a protein like tofu, avocado (optional, but not really optional), and something fermented. When I’m building this type of bowl I often go for sauerkraut or pickled ginger in a pinch, but sometimes I crave the funk of kimchi. It’s salty, tangy, and it really makes these bowls pop. The cauliflower rice is cooked in a simple sauce that’s made with coconut milk, miso paste, ginger, and rice vinegar. 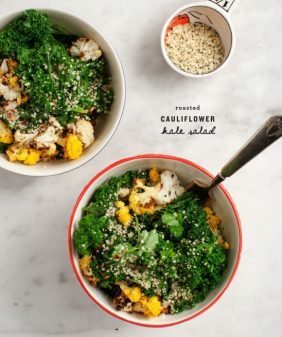 You don’t really see it pictured because it disappears once you toss it with the cauliflower, but it really pulls the flavors of these bowls together. I like to cook this all in a nonstick skillet because these cauliflower granules sometimes start to stick in other pans. Either way, it gets barely cooked – just enough to take off that raw bite, but not so long that it gets mushy. Make the coconut sauce: In a small bowl, whisk together the coconut milk, miso paste, lime juice or rice vinegar, ginger, and salt. Set aside. In a large nonstick skillet, heat a drizzle of olive oil over low heat. Add the riced cauliflower, the scallions, garlic, and a few pinches of salt, and cook, stirring occasionally, for 3 minutes just to take the raw flavor off the cauliflower. Remove from the heat and stir in ½ of the coconut sauce. Portion the cauliflower rice into 4 bowls. Wipe any remaining cauliflower bits out of the skillet. Heat the pan back to medium with a few splashes of olive oil. Add the mushrooms and a few pinches of salt and cook, stirring occasionally, until tender, about 5 minutes. Remove from the heat and stir in the rice vinegar and a few splashes of tamari. Add the mushrooms to the cauliflower bowls. 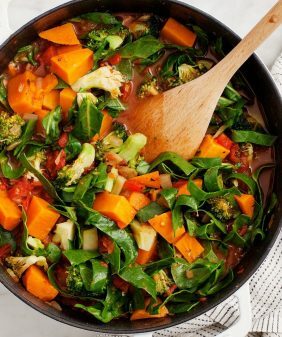 Wipe out the skillet again, add a tiny bit of water and the kale and cook over medium heat, covered, for 1 minute or until lightly wilted. Finish assembling the bowls by drizzling more of the coconut sauce over each portion of cauliflower. 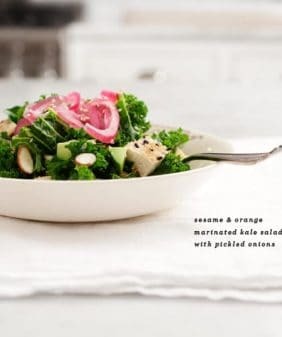 Add the kale, tofu, avocado, and kimchi to the bowls along with the microgreens and sesame seeds, if using. Serve with any remaining sauce and the lime slices on the side. To make these bowls vegan and/or gluten free, double check that the ingredients in your kimchi are vegan and gluten free. This looks delicious and I plan on making it this week. Thank you for posting/sharing! 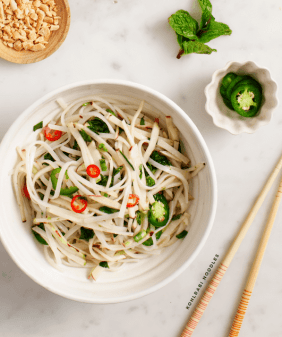 Quick question…you mention for the Coconut sauce to “…use 1 tablespoon rice vinegar OR fresh lime juice”, but the instructions state, “…In a small bowl, whisk together the coconut milk, miso paste, lime juice and zest, rice vinegar… Should I use both lime juice AND rice vinegar? Also, I didn’t see anything in the ingredients section indicating use of lime zest. Thanks so much! Oops, fixed that! You can use one or the other, not both and no zest. This is perfect!! I literally have all of these ingredients and I was looking for a lunch I could prep for our family for the week. Do you know if this stays nice in the fridge for lunches? I’m looking forward to giving it a try! Thank you for sharing. Love it when that happens! It’ll all keep for few days, I would just wait to cut the avocado pieces until the same-day. 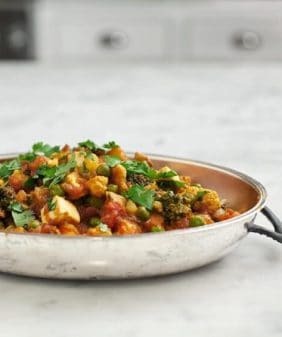 love this since I’m not regularly eating white rice but miss recipes like this, good tip too about the cauliflower rice not sticking together like white rices does, thank you for this recipe! I love cauliflower rice too. It has become a regular part of our meals. I’ve never used it in a bowl like this though. It looks delicious. And that coconut sauce with the lime juice looks fantastic. I’m going to make this on the weekend. I hope my kids like it too. I hope so too – let me know! I just found your blog this morning while searching for something to make with some ingredients I have on hand. I’ve already printed out 5 recipes and I am going to make sure I don’t lose you like I have lost track of so many blogs in the past. Tonight I’ll be making your Roasted Sweet Potatoes with Quinoa, Kale, Dried Cranberries and Feta. Can’t wait to see what the family thinks. I know my husband and I are going to love it though. I’m pretty sure these Cauliflower Rice Kimchi Bowls will be everyone’s first introduction to both of the main ingredients. It’s an adventure! I hope you love the recipes! Welcome! Looks delicious! Not a fan of mushrooms… any suggestions for a substitute? Thx! 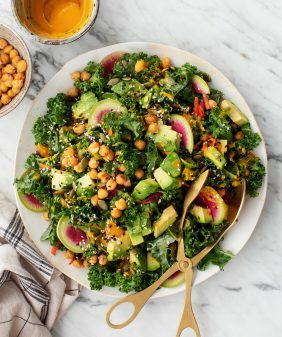 You could skip and just do a little bit more of everything else (more tofu, more avocado…), or some roasted broccoli with a splash of tamari and a pinch red pepper flakes could work here. I hope that helps! When do I add the tamari? to the mushrooms after the rice vinegar, just a few splashes to season them! Thanks Jo-Anne! It is so interesting! either one is fine! the thicker, the more rich, but I’ve done it with lighter coconut milk as well. The miso is really what makes it. Instead of coconut milk, could I use almond milk? I’d stick with the coconut milk – it might be a bit watery and lacking flavor with almond milk.